If you read my blog on Mungo's Mango Jam, http://lovetoeat.blog.com/?p=20, then you'll know that I love jams. And I love jams especially during the summer. And it's no small wonder since I put jam on a lot of things and eat it as desert, sometimes with cheese. I love my jams! So, I can see that as the summer progresses, there will be more jam recipes to hit this blog. Thus far, these last couple of months, I have worked on strawberry, cherry, apricot, raspberry, mango and fig jams...Ahhh fig. 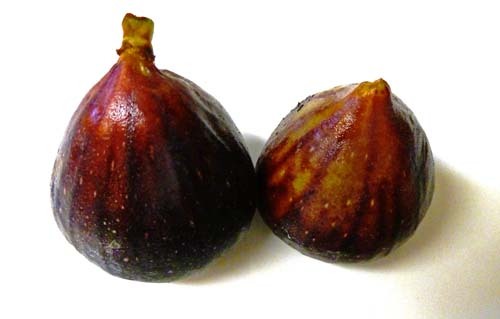 Fresh figs from California are in season now and they are bursting with figgy flavor. I love figs so much, that I like to slice them up and eat them plain. Not everybody's cup of tea, or fig, but I think they're wonderful. Winslow doesn't think that they're at their delectable best in the raw. He much prefers them in jam and this fig jam recipe is simply decadent. In most of my jam recipes, I try to keep everything au naturel. I hate adding things that might affect the flavor of the pure essence of the fruit. I am a purist at heart. 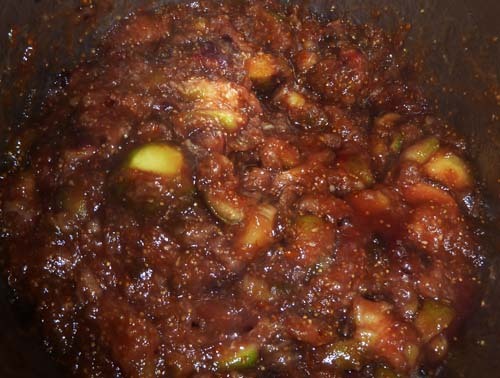 But I found when making a simple fig jam from Brown Turkey figs, that it needed something more. While the figs I used were naturally tasty and sweet, when I began to cook them, they seemed to lose some of their flavor. The fig jam is too bland. Enter liquor. The secret to this recipe is Brandy. It melds the flavors into a truly rich treat. Wash, stem, and slice the figs. Place them in a sauce pan and add the sugar. Set the heat to medium high. Begin stirring. This is another one of those recipes where carpel tunnel syndrome may set in before the jam is ready to eat from the amount of stirring that goes on. As the fruit warms up, the figs will begin to disintegrate. Continue stirring, and stirring, and stirring. When the fig mush begins to boil, reduce the heat to a high low. You want it to continue to cook and simmer. Continue stirring. As you stir this concoction, you may find that some pieces do not break up very easily. A potato masher is a handy tool in this case. Alternatively, you may want to put the mix into a food processor or blender. Be careful when you transfer the mashed fruit to a blender or food processor as it will be very hot. Continue to stir until the consistency of the mix is thick and brown, about 45 minutes to an hour total time. Taste it for sweetness. If it is to your liking, you're ready to add the brandy. Stir in the brandy and cook for a minute or two longer. Remove from the stove-top and let it cool. Once the jam has cooled off, transfer it to properly prepared Mason jars. Since this jam is not "canned", store it in the refrigerator and consume it within a week to avoid spoilage. A lovely way to serve this jam is over vanilla ice cream or with crackers over goat cheese. Just don't leave the plate of cheese and jam out where dogs might reach it. I know from experience how this delicacy can disappear in the time that it takes for me to turn my back. Not funny when you see your dog licking his chops and guests are about to arrive!